Whatever plant you want to increase by taking cuttings is divided into 5 easy steps. 1 Prepare your pots or tray. 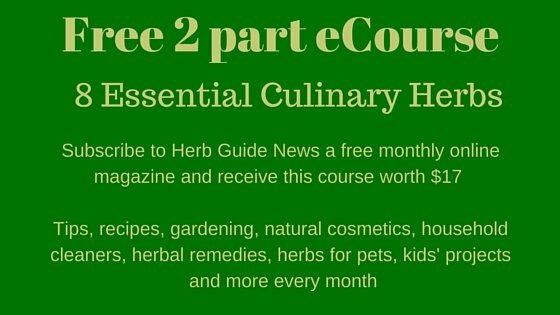 2 Take your plant cuttings. 3 Put them in your pots or tray. 4 Select the right place to leave them to root. All plants need the same treatment for propagation in steps 1 to 3 - steps 4 and 5 are where you need to separate the plants into tender and hardy. 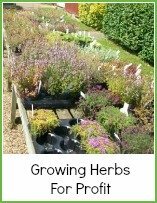 It is easy and cheap to grow plants from cuttings - a very efficient way of increasing your stock if you are interested in growing herbs for profit - or indeed growing plants for profit in general - link at the bottom for growing herbs for profit. Between July and September (northern hemisphere) hormones change and those that stimulate rooting are increased. You need a sharp knife and some soil. Some people like to use a hormone rooting solution or powder - I generally do just to be sure. You can use a greenhouse, cold frame, propagator or your windowsill. Methods differ for propagation by cuttings only slightly depending on the hardiness and where you're going to grow on. As a word of caution, remember that the 9 trays of 100 rooted cuttings will need potting on at some point - do you have space for nine hundred small plant pots? If not, think again about the quantities you're going to grow of each variety. As an aside here, you can mix cuttings in the same tray as long as they are all of a similar hardiness and you are able to identify them either by labelling carefully or because you can reliably recognise the species by leaf. So Step 1 in propagation by cuttings - Prepare your pots or trays. Take 3 inch pots or larger trays and fill to within about half an inch of the top with potting compost and water well. Allow to drain so that the dirt/soil is not waterlogged - about 30 minutes should do. Step 2 Take your plant cuttings. With a sharp knife cut a healthy non-flowering shoot about 3 inches long. Strip the bottom third of leaves and make sure you cut again where the lowest leaf was - you can see that by the scar left – this is where the hormone is concentrated most strongly. Also, the section below the leaf may die off and that could spoil your cutting by rotting in the soil and introducing fungus. Step 3 Put your cuttings in the pots or trays. 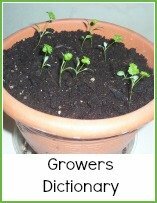 It is at this point that you would dip your cuttings in rooting hormone powder or solution if you wish to do so. Place up to 5 cuttings in a 3 inch pot - if you're using trays, then leave about 1 to 2 inches between the cuttings. Make a hole in the compost with a dibber or the end of a pencil. Put the cutting gently into the hole made and firm the soil around it with the dibber. 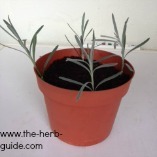 Once all the cuttings are in the pot, give it a gentle tap to level the soil and firm round with your fingers gently.